In my office hangs a poster of the Up-Goer Five. For those not blessed to have seen it, the Up-Goer Five is the brilliant creation of the xkcd comic strip. Essentially, it’s a drawing of the Saturn V rocket, with captions written using only the 1,000 most-frequently used words in the English language. The poster hangs in my office in part because it is awesome, and in part as a reminder and challenge to myself. The Up-Goer Five is a reminder that my job is to make that world understandable to those that live outside that world, and that doing so means remembering that not everyone speaks NASA-ese. I was thus delighted to discover The Up-Goer Five Text Editor, a clever homage someone created to the strip. Basically, it lets you try to write using only the same vocabulary used by the strip, those 1,000 most-used words. And let me tell you, it’s hard. But it has made me think a lot more about the words I use, and whether they’re really the best ones I could pick. I’m not going to say it’s completely changed my writing yet, but it does help. fireworks in my pocket — Ow. 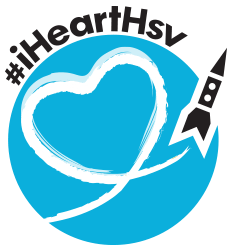 huntsville depot for the stars and stripes — This one’s not that amusing; I just wanted to say it’s a great program and teachers should take their students to it. is it unrealistic to give up social media for lent — Yes. skydining playlist — I’m assuming this is a typo, but I like the idea that somewhere you can jump out of an airplane and enjoy a tasty meal on the way down. And, apparently, listen to music. I want to do this. Please? old miss picture adult — I’m not sure if I want this one to have meant Ole Miss, or not. 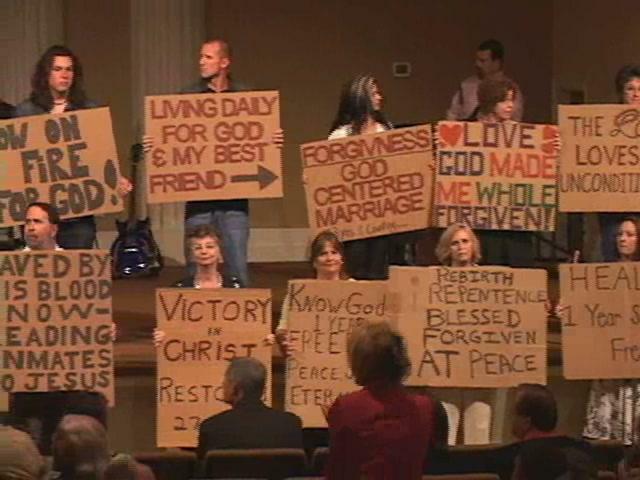 A few years back, “cardboard testimonies” were all the rage. If you haven’t seen them, it’s essentially a very very simple “before and after” story of the difference God has made in a person’s life. On the front of a small sign, you write the before, something you were struggling with before coming to know the Lord. On the back, you write the after, how that struggle has been resolved. Churches would have services were lines of people would wordlessly come out, show the front of the sign, flip it over, and show the back. It’s an incredibly powerful demonstration, a starkly simple and focused presentation of the transformative power of grace. But at church recently, I got to thinking about what happens to the cardboard signs that only have one side. It seems sometimes like we have set a very performance-based value proposition for God. There’s a gentlemen in one my church groups who has been fighting a very long and very heated custody battle, and recently marked a major victory along the way. Everyone in the class talked about how faithful he’d been, and how God had honored that, and used it as evidence of how good God is. But what if it had turned out differently? What if the custody situation had turned out differently. In any battle, there’s a winner and a loser. What happens when you’re on the losing side? What does that say about God? What does that say about His goodness? The Bible talks about the people who didn’t get to see the fulfillment of the promise. The people who didn’t get the happy ending they wanted. Moses, who didn’t get to enter the promised land. David, who didn’t get to build the temple. We like to downplay those stories. They don’t fit our version of a performance-based system for rating God. But what do you do with that when your story isn’t happily ever after? Where would Moses and David fit in our churches? Do they get to walk across the stage with their pieces of cardboard? “Spent 40 years in the desert.” Flip. “Died without entering promised land.” I’m sorry, Mr. Moses, that’s not the sort of testimony we’re looking for; why don’t you watch from the pews? God isn’t performance-based. He never promised you a happy back side of your piece of cardboard. He promised comfort in the hard times. He promised eternity. He promised Himself. We need to stop selling Him short by promising people happy words on cardboard when what He has is so much better. I want to see a church where people walk across the stage with their pieces of cardboard, and flip them over to reveal blank reverses. I want to see the same thing written on the back as the front. I want to see the back side be worse than the front. And I want that to be OK. I want the church to be able to celebrate those stories, and those people. I want people with those stories to know that there is a place where they are welcome and valued. I want a church where Moses and David could share their testimonies. I want to go to the church of the unseen promise. Anybody want to come with me? As you recall, I wrote a post a couple of weeks ago that featured the “Nothing Beats An Astronaut” commercials for the space contest being held by Axe, makers of men’s (and women’s) body wash, shampoo, body spray, etc. In support of the contest, which will award suborbital spaceflights to winners, Axe has also created another advertising campaign with the tagline “Leave A Man. Come Back A Hero.” The implication of the ads is that going to space would help the winner get women. Apparently, there are those who believe that the campaign is sexist. These, presumably, are also the sort of people who believe that fire is hot and water is wet. Arguably, there is merit to the allegation that Axe, a product which sells itself in an arguably sexist way as being able to help guys score chicks, is also being sexist in selling space as being able to help guys score chicks. Further, they argue, Axe is downplaying the real important factors of spaceflight by focusing on this sexist angle. Where’s the discussion of science and spin-offs? The fact that both sides are completely in the right speaks to the greatest challenge in space advocacy. Yes, Axe is being sexist. As odd as it is to find myself defending Axe, so what? Their entire business model is aimed at men, and aimed at helping men get women. You can’t be surprised that a contest they are sponsoring supports their business model. Nine years ago, 7 UP offered a similar contest. I would imagine view people would be surprised that they used the contest to try to convince people to drink 7 UP. And, here’s the thing, Axe isn’t wrong. There’s ample anecdotal evidence that back in the olden days of spaceflight, women might, in fact, have been scored via the mystique of spaceflight. Like it or not, but Axe has a set focus that guides their business. They’ve applied that focus to spaceflight. They’ve depicted spaceflight in a way that reflects their focus. Saying they are wrong to do so is like saying that deep-field astronomers are wrong for not talking more about the benefits of microgravity science, or that orbital science principal investigators are wrong for not talking about the potential of space solar power, or that the space-based alternative energy community is wrong for not talking about the lessons that could be learned from boots-on-the-ground planetary geology, or that human exploration advocates are wrong for not talking about how astronautics can help you get babes. Big enough, in fact, that it can be many things to many people. Why should we explore space? It depends on who you ask. There are countless space advocacy groups, and equally countless reasons to advocate for spaceflight. It makes it an incredibly difficult thing to explain why we should explore space when the answer depends on whose doing the talking and who they’re talking to. And that may be the best reason for exploration that there is — that space offers so much potential, so much promise, that no one group can explain everything space can enable us to do. Including, but not limited to, scoring chicks.